Tennis club WordPress themes for tennis facilities and country clubs, sports centers and tennis instructors, badminton and other sports, sports news and events, tours and tournaments websites and blogs online. Tennis is often characterized as aristocratic or even royal form of sports. And it’s not just that many celebrities and famous people, representatives of the ruling dynasties and successful businessman like to play this game. The true aristocratic nature of the game is given by the atmosphere that prevails during the matches. The spectators turn off their phones, keep calm and applaud only after the brightest moments in order not to disturb or confuse the players. Other valuable gestures including handshakes and polite behavior towards the opponent are also the unique characteristics of tennis proving its elegant and aristocratic nature. With such traits of tennis and not only, your relevant website or blog revolving around tennis world or tennis club should be the clear reflection of the game itself, with respect towards your web guests, smooth and hassle free elegant atmosphere for them to enjoy, comfort across different mobiles and beautiful images and legible content to follow. In this respect, we have surfed the Internet for the best and niche specific sports and tennis club WordPress themes to cover all your topics and activities catering to tennis and tennis clubs, tennis tournaments and cups, celebrity tennis players and their careers, sports news and not only. All of those tennis club WordPress themes are also customizable enough to cater to any other sports and fitness activities as well, from football and soccer to gym and weight loss activities and trainings. 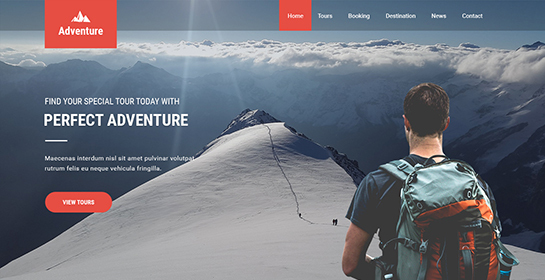 Let’s your online journey start with Adventure as one of the most reliable and motivational adventure and sports, golf and tennis club WordPress themes you can have at your disposal. Whether you need a crispy platform on which you can test you creativity and put it into action, or just go live with the default version of what is offered to you, Adventure will be ideal solution for you. With prebuilt homepage sections and additional content zones, image based homepage slider and gallery area for making your website visually stunning, Adventure also comprises color and font changing options, shortcodes pack for instant updates and content setup, cross mobile compatibility with complete responsiveness and much more. Attract your website visitors and convert them into the active members of your sports club or fitness center with the help and unique charm of Soccer. 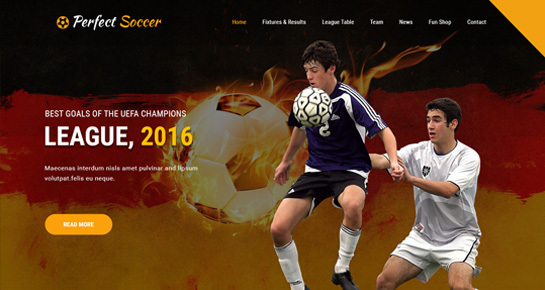 Elegant and stylish, premium quality and security checked, Soccer provides you with a totally manageable website building framework put into practical package that can be acquired at an affordable price. Create and showcase all the conveniences and facilities of your tennis or country club, trainers and instructors, offer membership plans and other services via the prebuilt sections of the theme, give the contact details and information via controllable footer, header areas which are always noticeable whenever people land on your profile. All the nuances of plugin compatible and clear coding for the theme potential extension are taken care of. Green based and highly serviceable, awe inspiring and extremely user friendly, Perfect Golf Club is another leading template among golf and tennis club WordPress themes for any sports based websites and profiles online. Stable communication with your team and its members, clients and customers, trainers and trainees is the key element to your business success. Perfect Golf Club readily takes care of building reliable cooperation and relations with all the interested candidates and parts. Let you customers enjoy the whole beauty and power of your tennis club via your website and its images, get in touch with you via a proper contact form or find your location with a few simple clicks. The intuitive dashboard of the theme enables you to take charge of the general form and function of your site to make it highly attractive and results driven. Boost your tennis club or court popularity and client recognition by combining the best strategies the digital world offers you by the application of Strong Pro. As one of the most powerful yet cost effective, top notch yet lightweight tennis club WordPress themes as for now, it incorporates a myriad of handy features and controls, including Google approved responsive touches, footer and header layout variables, inner banner area and blog section, page templates and more. For today’s commercial based industry, trading is more than just shopping or purchase. It is also about an excellent user and customer experience. In this relation, Strong Pro is unbeatable with its commercial ready layout and WooCommerce compatibility for creating any online store and selling tennis products, clothing, accessories, rackets and more. Any sports and yoga related club, center, complex or organization can highly benefit from the advantages Yogi Pro celebrates. Whether you are an experienced yoga specialist or tennis instructor with no coding experience at all, you are welcome to check the capabilities of this template ready to make your business more prosperous. It’s SEO and SMO integration, cross mobile compatibility and shortcodes based performance paired with modern coding greatly contribute to the process of making your website more user centric, as well as more discoverable in the virtual platform. Fitt takes the whole responsibility of making your customer experience enviably good and your interaction with them excellent thanks to its comprehensive and compact nature supported by the essential theme components and attributes. With hassle free dropdown level navigation and fast loading rate, convenient content and imagery organization possibilities via the loaded sections of the theme, Fitt knows how to share the benefits of social media networks as well, since it is totally optimized for SMO as well. Moreover, the SEO optimization of the theme will take your profile “where the eyeballs are”. It means that your profile will be ranked higher and will be offered to the people searching for relevant tennis related content via search engines.